It started with rain, lots of it! The whole of Thursday it fell, but undeterred, my husband and I went shopping. I don’t like rain but SALDI (sale) signs are hard to ignore, Via Corso, Via Ottaviano, Via dei Condotti (no sales here...as if to say if you can’t afford our prizes....) and all the side streets in between. So we braved the weather, came home slightly damp but happy with all the bargains we brought home with us. On Friday, schools were called off and wet snow fell the whole day. 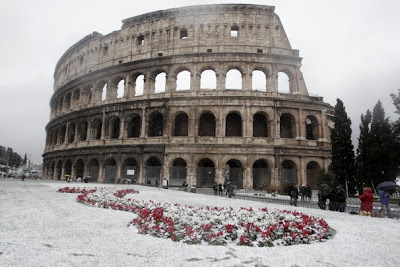 Going out on the streets was perilous, as Romans, especially Roman drivers, are not used to snow of these amounts. My husband and I were undeterred having lived in Montreal for the better part of 4 years, where temperatures of -16 C was taken in stride and 6 inches of snow was hardly noticed. Getting to the city was no problem, trains and buses were running but the Colosseo was closed and so was the Forum, something that had not happened in maybe over 20 years. And today, Saturday, we woke up to the sight of snow covered streets and trees even in our neighbourhood. We woke up late morning which rarely happens, this because of the unusual silence since only buses were on the road, our neighbours deciding to stay in, at least until maybe lunch? An addendum: A curious thing we have come to get used to here is the absence of a clothes dryer. Most of the apartments in our area dry their clothes out in the veranda, which we have been doing since we got here. But with the onset of winter, drying can take three days, two outside and a whole day beside the heater. But last Thursday I washed some clothes and put them out to dry. Forgot about this and remembered it only this morning. So we have to contend with another unforgetable memory of Rome.... frozen underwear! Returning to Rome after the Christmas holidays was difficult for me, ...really? What, you might be asking, is so difficult about returning to one of, (if not) the most interesting cities in the world? It is difficult to explain really, simply because the feeling is visceral, taking in the sights, listening to the sounds and inhaling the scents, my enjoyment is tempered by a tinge of sadness. This feeling washed over me the first day I stepped out of the Ottaviano Metro stop upon my return. It was a beautiful day, another one of those dazzling sunshiny days with an amazing cloudless aquamarine colored sky, and a decidedly chilly breeze. Pleasantly surprising though was the absence of the hordes of tourists. So I walked without hindrance toward my destination....Saint Peter's Basilica. Returning to Saint Peter's was appropriate, I felt, this was a good place to start saying my goodbyes. After all, St Peter's dome dominates the skyline of Rome. 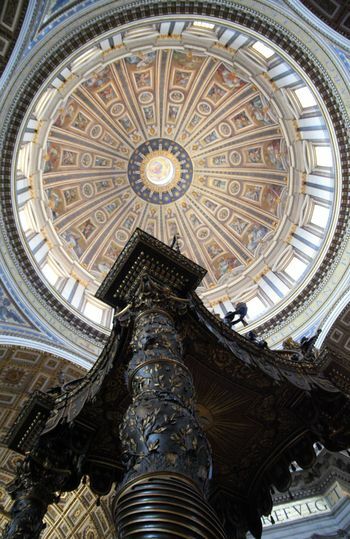 Everything about St Peter’s is done on the grand scale, decades in the making, a collaborative effort of numerous artists including Michelangelo, Bernini, Bramante, Raphael, from the Piazza to its interior, from the works of art to its relics, it is truly an awesome sight! Approaching the square along the Via della Concilliazone (constructed in the time of Mussolini) one gets an overview of the magnitude of the place. This approach allows one a truly dramatic entrance into St. Peters. The square was designed by Bernini as was one of the fountains in the square. Bernini designed the colonnade symbolizing a pair of open arms, symbolically welcoming the world into the Catholic Church. On top of the colonnade are 140 statues of saints, crafted by different artists through the span of over 50 years, beginning in the middle of the seventeenth century. And in the center of the square is an egyptian obelisk. The dome on the other hand was designed by Michelangelo and is well worth the climb as the square when viewed from this height resembles a key hole, very symbolic indeed. Adding spectacle and color to the granduer of the square is the sight of the Pope's personal bodyguards, the Swiss guards in their 15th century designed uniforms, (which was not as many believe designed by Michelangelo). And when one enters the basilica (it is not a cathedral), the grandeur, the opulence and the sheer magnitude of the place cannot but fill one with a feeling of awe! Present day visitors, visitors from other eras, catholics and non-catholics alike share this feeling of awe, perhaps even verging on the spiritual. Stendhal in his Roman Journal (1827) expresses this succintly, "One cannot help worshipping the religion that produces such things". Because St. Peters has numerous windows set high up, one catches glimpses of light beams, adding to its grandeur. Upon entering, turning right brings one to the altar that contains Michelangelo’s Pieta, maybe one of the most iconic depictions of the aftermath of Christ’s crucifixion. Standing there, I was struck and confused by the serenity in the expression of the Virgin. I guess this total acceptance, almost a resignation did not resonate with me. There seemed to be an innocence, maybe even naiveté in this serene acceptance, perhaps a reflection of the youthfulness of the then 25 year old Michelangelo? There are innumberable works of art that one encounters in St. Peter's. One of them is Bernini's baldachino or canopy over the papal altar. The dome is supported by four piers with large niches at their base upon wihich rests 4 gigantic sculptures each representing the basilica's 4 major relics: St Helena with the Holy Cross, St. Longinus with the spear he used to pierce the side of Christ, St Andrew with the cross upon which he was crucified and St. Veronica with the veil she used to wipe the face of Christ. In addition to these giant statues, one encounters what can only be the largest and most elaborately decorated holy water font. The Basilica was built over St. Peter's tomb. A statue of St. Peter attracts many to take pictures and at one time pilgrims and the curious were even allowed to stroke his extended right foot. 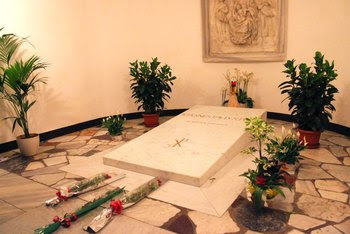 In the crypt is where most of the popes are interred, the most recent being John Paul II. The basilica also contains the remains of other popes, some of them declared saints and others in the process of being declared. In one of the transcepts, one can view the incorrupt body of Blessed John XXIII, the pope responsible for convening the last Ecumenical Council. I mention this pope in particular because my uncle, a Jesuit priest, served as his secretary at one time and when John XXIII died, we were in Rome and braved the crowds to view his remains, almost getting crushed in the process! It can take time walking around St Peter’s. Although it is not the seat of the Pope (St. John Lateran has that honor), it is to most Catholics the most important church in Christendom. But it is no longer the largest! 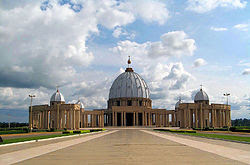 The Guiness Book of Records gives that honor to the Basilica of our Lady of Peace in Yamoussoukro, Cote d’voire. 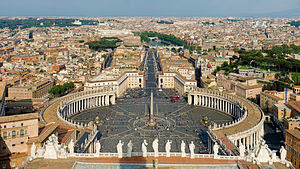 The basilica was built along the lines of St Peter's but one can't call it a replica. I visited this church when we lived in Boake, Cote d’Ivoire, a strange site, indeed, rising up along a sparsely inhabited stretch of highway on the way to Abidjian, Cote d’Ivoire’s capital. The church has beautiful stained glass windows, with a very African flavor. Even the mass we attended was replete with African drums and worshipping was active and lively, with singing and dancing as the norm.